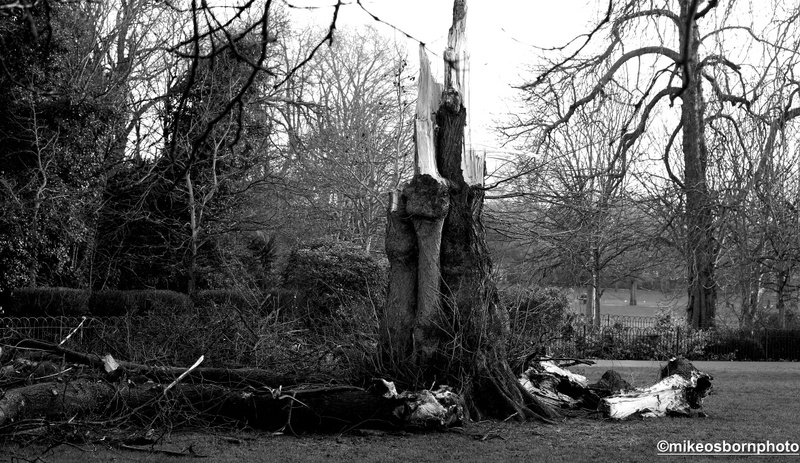 During the stormy winter, this mature tree in Ravenscourt Park close to my home in west London was taken out by a freak bolt of lightning and reduced to a jagged stump and tangle of wood. It’s a sad sight but one which provoked my curiosity. I scoured the area with my macro lens, capturing the textures and markings left by the impact and sawn debris. At close quarters, these are intriguing and almost otherworldly. I also found some beautiful, rich green lichen still clinging to its fallen host. Even in death and destruction, nature holds beauty and food for the camera. What’s more, the lost tree is now recorded for posterity. Amazing – so much to see in close up – you have captured another world. Inspiring. Thank you Diana. Poor tree, but it did reveal other textures and shapes. What a beautiful set! I feel bad for the tree though. Thank you Tassem, much appreciated. Yes, me too, though it was an act of nature which usually has a good reason to do what it does. Remarkable photographs. Poor old tree. Poor old Ravenscourt Park. Ages since I’ve been there and we’re only in SW14! Thank you very much, Sarah. Thankfully there was just the one casualty. It must have been its time. It’s a lovely park, has served me well photographically speaking. You ought to come and reacquaint yourselves with the place! Yes, your trees are always so alive and robust. But this is nature’s way. I did enjoy exploring the wreckage on one of very wet winter’s days. A Harley? Sounds exhilarating! Enjoy catching the breeze :-) Greetings from a very mild London where Spring has sprung quite suddenly! Well I guess you were spared from all the Arctic blasts of the winter in your warm part of the world. Yes, nice to have some sunshine here! Everyone feels a little bit better, I think. Great set of excellent images! Hi Robyn, many thanks, glad you enjoyed it! I wish I could take credit – it’s simply a gallery created in WordPress. This is set to mosaic. I’m not sure it’s universal to all themes. It does take some jiggling around to get right, and the mosaics generally require multiples of three to be balanced. Does any of that make any sense?! Thanks! It makes great sense Mike. I’ll have to check out the options on my “theme” and see if I can do that! Best! Excellent! I hope they’re available to you. Let me know how you get on.